I used a heart-shaped cake pan handed down to me from my father-in-law. 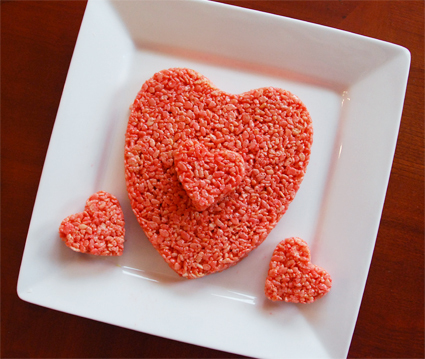 He started a family tradition of making a Rice Crispy Treat heart for his kids every Valentine’s Day. I made this tradition my own my adding a few of my own touches. They were a hit with everyone! In a large saucepan melt butter over low heat. Add marshmallows and stir until completely melted. Remove from heat. Add the Rice Krispies and stir until well coated. Using a buttered spatula, press the mixture into a 13″ x 9″ pan coated with cooking spray. Let cool, cut and serve. 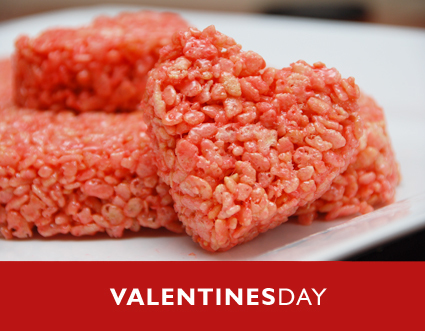 When melting the marshmallows, add red food coloring to your preference. 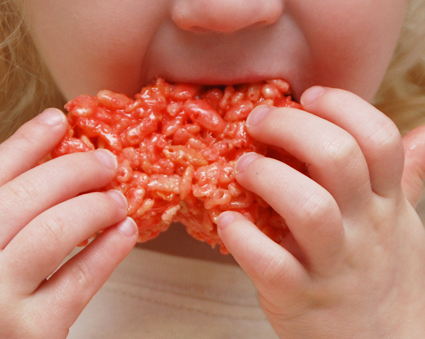 Darker pink and red tones tend to show up better after mixed with the Rice Krispies. Whether you use a cake pan or a cookie cutter as your mold, be sure to coat it well with oil. I always wet my hands to keep the gooey mixture from sticking to my hands. Be sure to press the mixture well into the form to prevent gaps or holes. You want a nice smooth shape when you are done.